I work with a variety of tools and materials according to the piece of work I am making, its purpose and the setting it will be in. For a commissioned piece it may be a given surface or the need to go in a particular location which determines the size, scale and design of the work. For my own pieces, the starting point is usually the meaning of the words and how I respond to them. I then choose the materials and media that will allow me to express that in the best way. These letters have been written with a quill onto handmade paper from Minnesota. 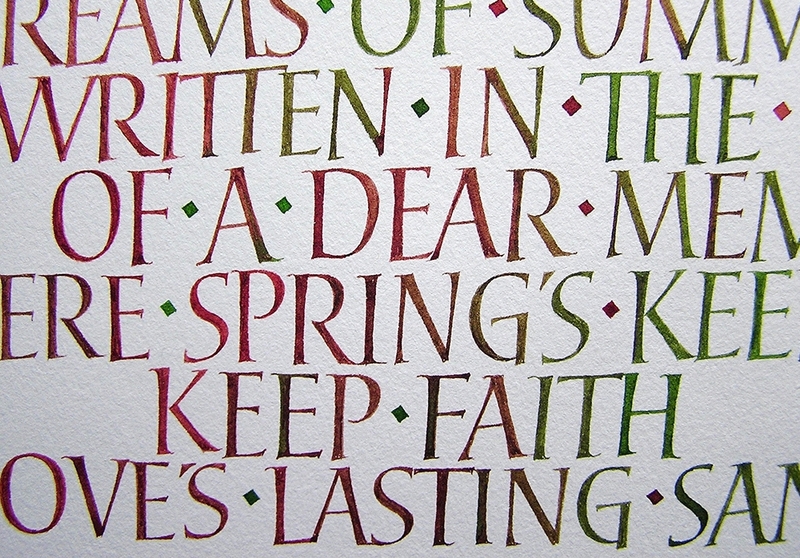 One of two pieces using words by Charles Dickens now in the V&A museum. Paper comes in a wide variety of textures, colours and thickness enabling the right surface to be found for each individual piece of work. 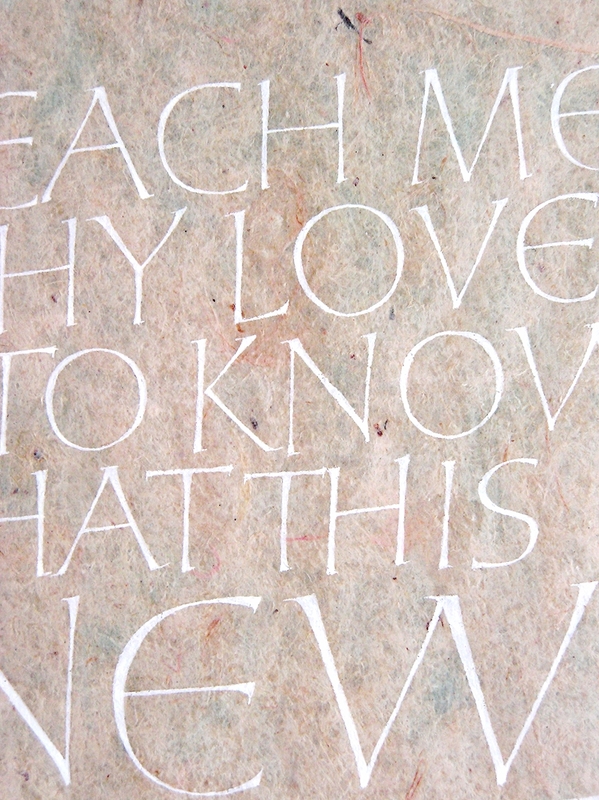 Where possible, I use handmade paper because every unique sheet has a life of its own, the letters that are worked onto its surface brings the paper alive as it responds to the spirit of the surface as well as the meaning of the text. Detail of letters painted with gold acrylic paint onto muslin then stitching applied around the letters. 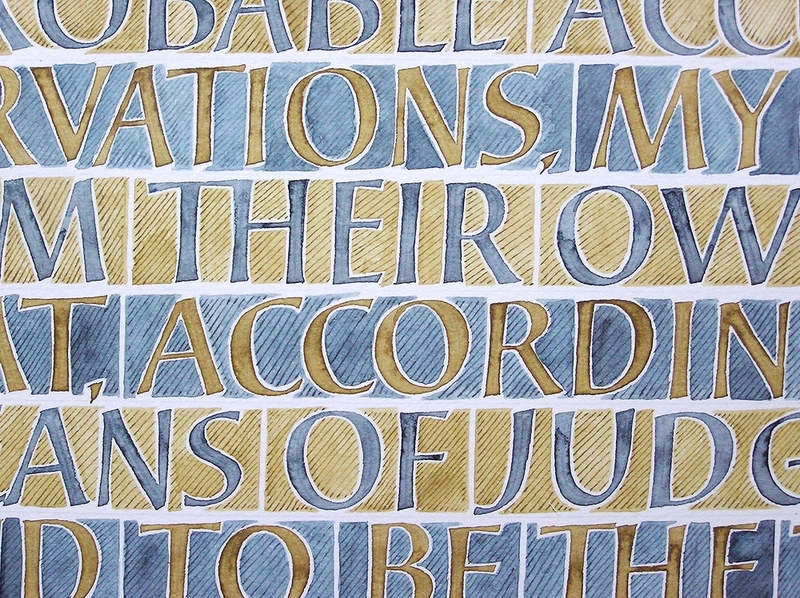 Applying detailed lettering to fabric becomes possible when the letters are painted. The paint is applied using fine pointed brushes directly to the surface of the cloth. 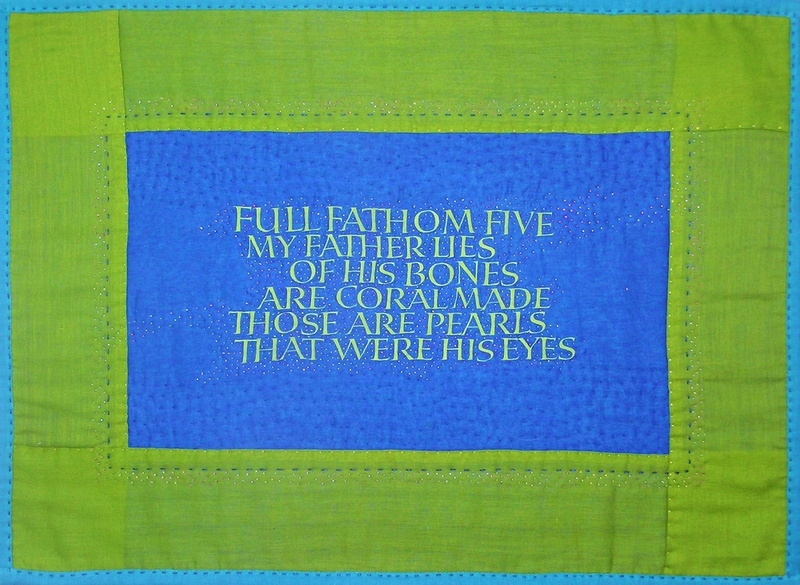 The letters are designed for each unique piece of work, being influenced by the texture, quality and properties of the fabric. 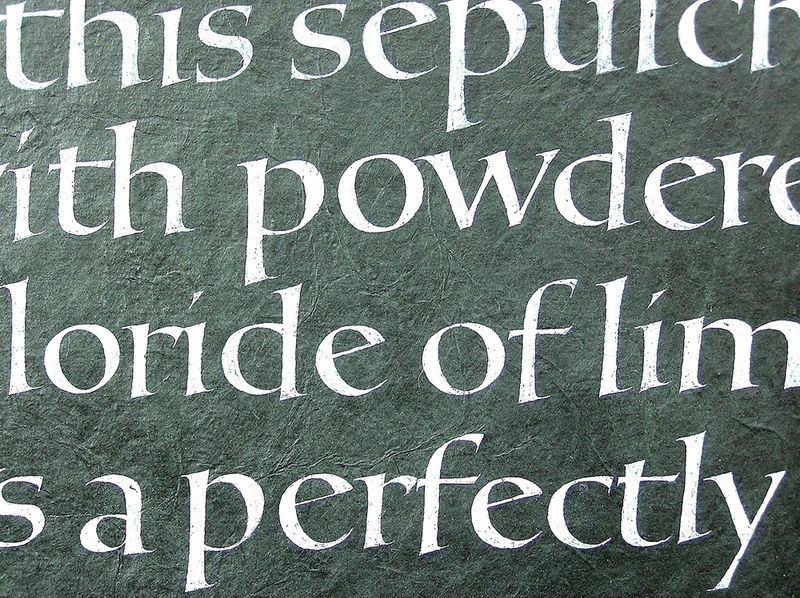 Working on a headstone, letters being carved in York stone. Letters carved and painted onto stone and slate are used for work that has to be outside, such as house names, memorials and commemorative plaques. But stone and slate looks good indoors too and is durable and can be cleaned and doesn't need a frame. 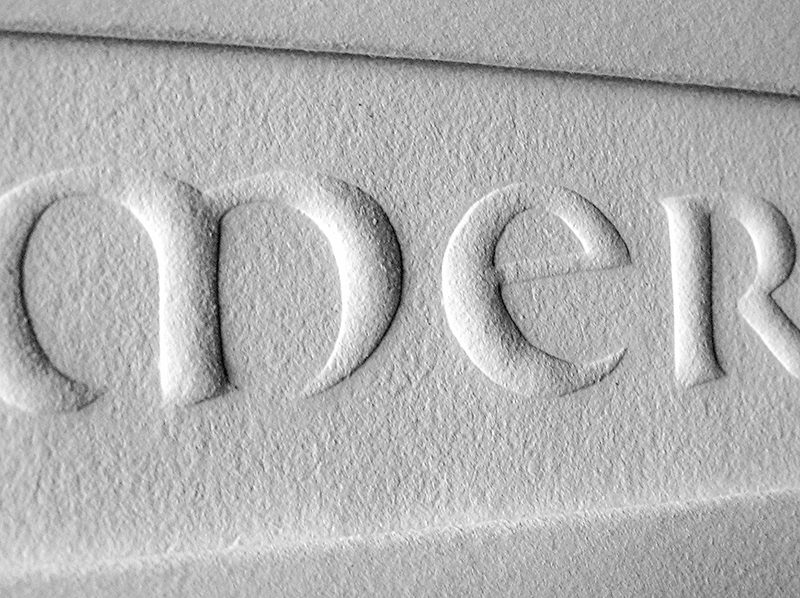 Lettering on vellum to be used as a book covering. The markings of the hair follicles in the skin form a decoration. 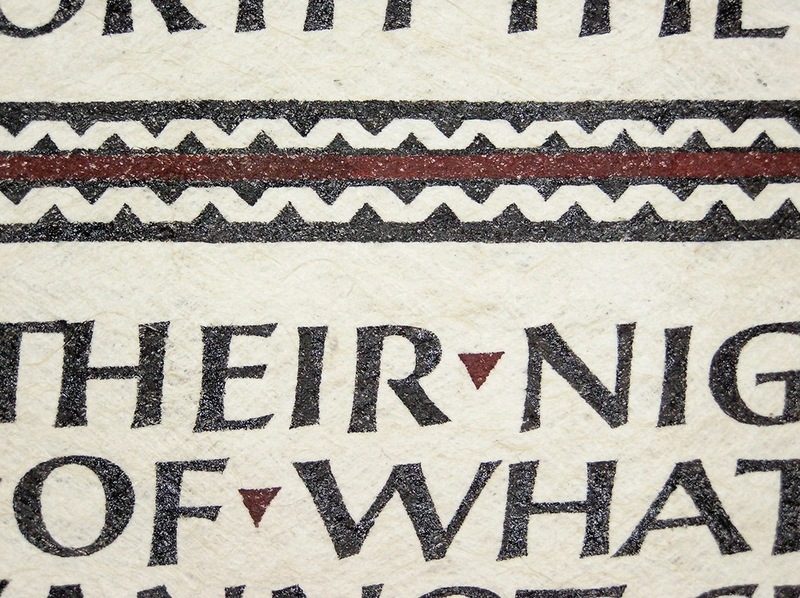 Vellum is made of calfskin, prepared in a way that is centuries old to create a velvety surface, perfect for writing on. Medieval manuscripts were made with vellum pages that took ink and paint and gold perfectly, almost always applied with a quill made from a goose feather. As a contemporary medium, vellum is full of character as each skin is unique in its tone, patterning and behaviour.